On 5th February, numerous rumors and concerns were buzzing around in the blogosphere over the number of links being reported within the “Link to Your Site” section in Google webmaster tool. Some of the webmasters were claiming that they have seen 80% decreases in their number of backlinks within the “Link to Your Site” Section. Most of the webmasters claimed that their all backlinks are right in their places, but were pretty much stressed out Why Google Webmaster tool is not displaying them. Bloggers did lots of discussions on various forums that including the Google Webmaster forum. What is happening, Why my links are vanished. Even i am not using any disavow link tool. 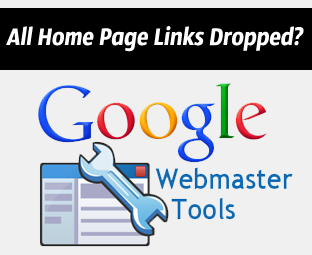 Yet, my backlinks are disappearing from webmaster tool. Quite astonishing. On a serious note, there is no need to freak out or lose your calm because it is just a fluctuation that is causing the whole issue. There is no need to worry because few of the websites under our network are also witnessing the same fluctuation. It seems as if Google has stopped displaying those backlinks which are pointing to your homepage. Since, most of the backlinks are pointing to the homepage. Now, if Google stops reporting those backlinks, then your link count may drop significantly. When you will login into your Google Webmaster account and selects “Link to Your Site”, and under “You Linked Content” you will notice that there is no homepage. This is something weird? Thanks for the report, Anne (and thanks for escalating, Stevie!). This looks like an issue with how the data is displayed in Webmaster Tools, it shouldn't affect your site's crawling, indexing or ranking. I don't have any specifics at the moment, but the team is looking into the details to see what we can do here. Thanks for your patience & sorry for the confusion! I am not satisfied with the justification that John has given above because they run a large organization and they should know what the real problem is. I Hope they will answer it sooner because it seems like a bug, not a feature. On the other hand, Bloggers should maintain their calm because bots will crawl your site is similar fashion as they use to do in the past. great informative article brother, keep it up. SYED SIR!! PLEASE HELP ME!! THERE IS A MASSIVE TROUBLE! Sorry to Hear that Buddy. But there is no way you can get that back. The only way that could help you is to restart your Blog again over WordPress. You can contact Blogger but they would have taken that diction after testing and verifying your site again and again. Yes I also have heard it from many of my blogger friends Your this post clarifies everything about Those missing links . Thanks For sharing it. Still have 90% of links missing from WMT. Has anybody any current information?